Congratulations to Meryl for receiving a Best Actress nomination by the British Academy Award (BAFTA) for “The Devil Wears Prada”. Nominated in the same category are Penelope Cruz (Volver), Judi Dench (Notes on a Scandal), Helen Mirren (The Queen) and Kate Winslet (Little Children). “The Devil Wears Prada” has received 3 more nominations for Best Adapted Screenplay, Best Supporting Actress (Emily Blunt) and Best Costume Design. This year’s Orange British Academy Film Awards will be held on Sunday 11 February 2007 at the Royal Opera House in London. A list with all nominees can be found here. According to Variety, Meryl Streep is set to star in the upcoming movie version of Phyllida Lloyd’s musical “Mamma Mia”. Lloyd, who directed the original in London as well as its Broadway incarnation, will make her feature directing debut on the pic, which will be shot in London and Greece. Streep will play the rebellious single mother of a bride-to-be who never met her father. The daughter invites three likely paternal candidates to her wedding, and the ensuing conflict triggers the performance of 22 Abba hits. An accomplished singer, Streep had been wooed for musical adaptations including “Evita,” but “Mamma Mia” is her first full-blown musical. She sang in films including “Postcards From the Edge” and last year’s “A Prairie Home Companion.” Producer Judy Craymer is quoted by Variety that Meryl “was always at the top of our wish list, and she encapsulates the spirit and energy and has the powerhouse qualities that character requires”. Meryl has won the National Society’s Best Supporting Actress Award for both “The Devil Wears Prada” and “A Prairie Home Companion”. She has been further received a nomintion as Best Supporting Actress from the St. Louis Film Critics. Many thanks to Frank for the heads-up. Congratulations to Meryl for receiving a Best Actress nomination by the Screen Actors Guild for “The Devil Wears Prada”. Nominated in the same category are Penelope Cruz (Volver), Judi Dench (Notes on a Scandal), Helen Mirren (The Queen) and Kate Winslet (Little Children). The SAG Awards are handed out on January 28, 2006. A list with all nominees can be found here. Congratulations to Meryl for winning her career’s 21th Golden Globe nomination as Best Actress in a Comedy for “The Devil Wears Prada”. She shares the category with Annette Bening (Running with Scissors), Toni Collette (Little Miss Sunshine), Beyonce Knowles (Dreamgirls) and Renee Zellweger (Miss Potter). The Golden Globes will be handed out on January 15, 2006. Meryl’s upcoming thriller “Dark Matter” will have its world premiere at Sundance. Festival organizers on Thursday announced the remainder of the festival slate, covering the premieres, and the Spectrum, Park City at Midnight, Sundance Collection and New Frontier programs. A complete lineup and airdates for “Dark Matter” will be published by the Sundance Institute later in December. Visit the Official Website for more information. The awards season has started with the critics awards being announced these days. Meryl has received a Best Actress nomination for the Critics Choice Award for “The Devil Wears Prada” and shares an Acting Ensemble nomination with the cast of “A Prairie Home Companion”. 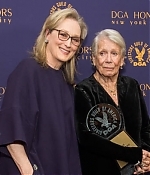 She was also named a runner-up for the Best Actress award by the New York Film Critics Association and the Boston Film Critics (in the supporting actress category). Further, “The Devil Wears Prada” has been featured among the Top10 Movies of the Year lists by the American Film Institute and the National Board of Review. The Golden Globe nominations will be announced this Thursday – the Critics Choice Awards will be handed out on January 12, 2007. As the 2007 awards season kicks off, Meryl has received a nomination for the Satellite Award as Best Actress for “The Devil Wears Prada”. She shares this category with Julie Walters (Driving Lessons), Annette Bening (Running with Scissors), Toni Collette (Little Miss Sunshine), Jodie Whitaker (Venus) and Beyoncé Knowles (Dreamgirls). “The Devil Wears Prada” also received nominations as Best Picture – Comedy and for Patricia Field’s Costume Design. A full list with all nominees can be found here. According to the Hollywood Reporter, Meryl Streep has joined the cast of New Line Cinema’s “Rendition,” a political thriller starring Jake Gyllenhaal and Reese Witherspoon and being directed by Gavin Hood. Written by Kelley Sane, the multilayered story centers on a CIA analyst (Gyllenhaal) based in Cairo who finds his world spinning out of control after he witnesses the interrogation of a foreign national by the Egyptian secret police. Witherspoon is playing the pregnant American wife of the national. Alan Arkin also has been cast, playing a senator. Streep is a government official who orders the rendition of the national. Shooting is under way in Los Angeles. The production also will shoot in Washington, Morocco and South Africa. Read the full article here. USA Today has published reactions and condolences from many of Robert Altman’s colleagues and actors, including Meryl Streep. Her statement is below, the full article can be read here.